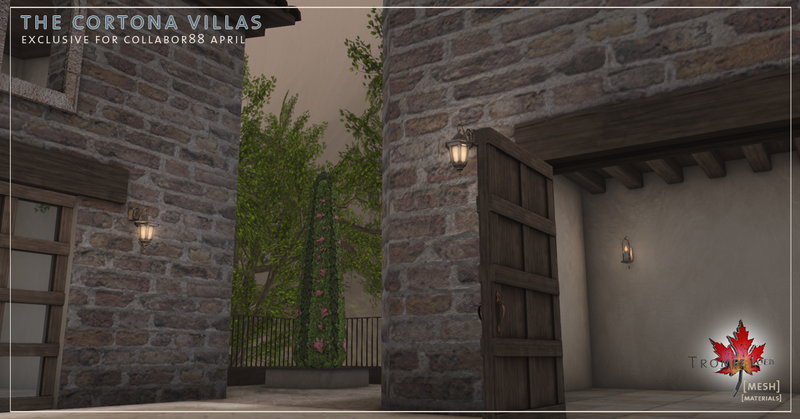 The warmth of the Tuscan sun has finally arrived at Collabor88! 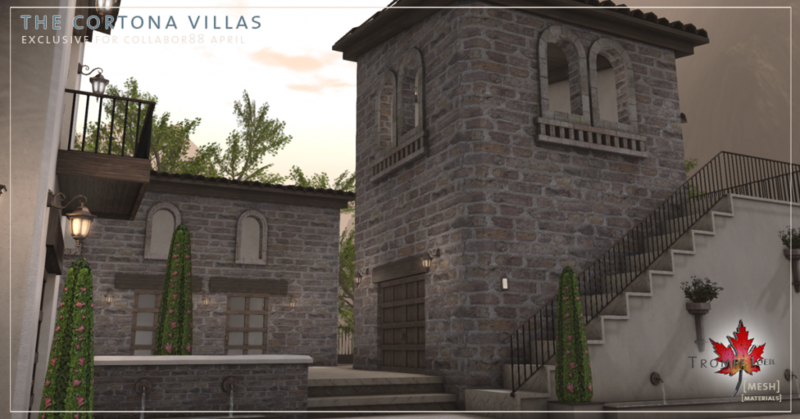 Embrace spring with our biggest mesh prefab build yet (on-site demo here) – The Cortona Villas are an artfully arranged series of several small Italian villas framing a central bi-level courtyard with outdoor fireplace and built-in water features and planters. 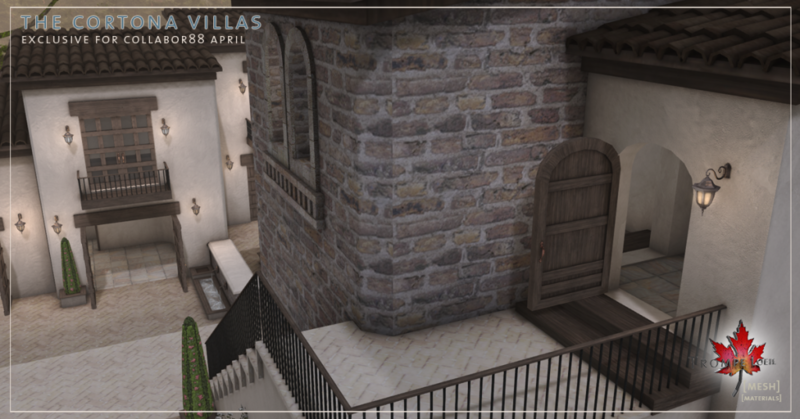 Create your own tiny Tuscan village instantly – and for a fantastically low C88 price! 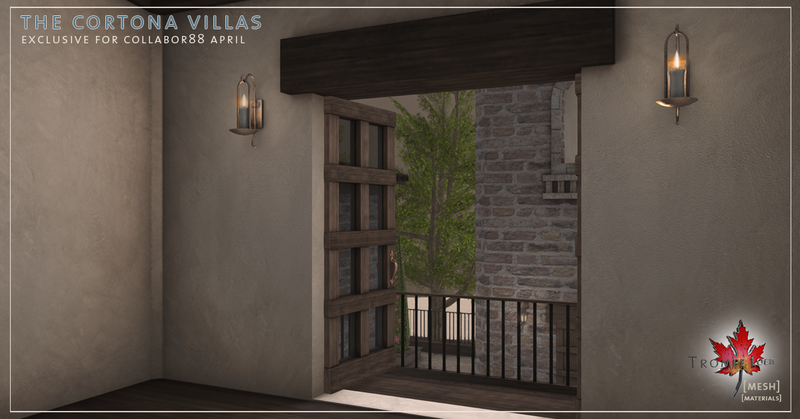 Your Tuscan adventure begins in 6/8 individual rooms spread among several rustic buildings, gently lit both inside and out, surrounding a dual-level patio and outdoor fireplace. Use the included greenery or substitute your own in the built-in planters. 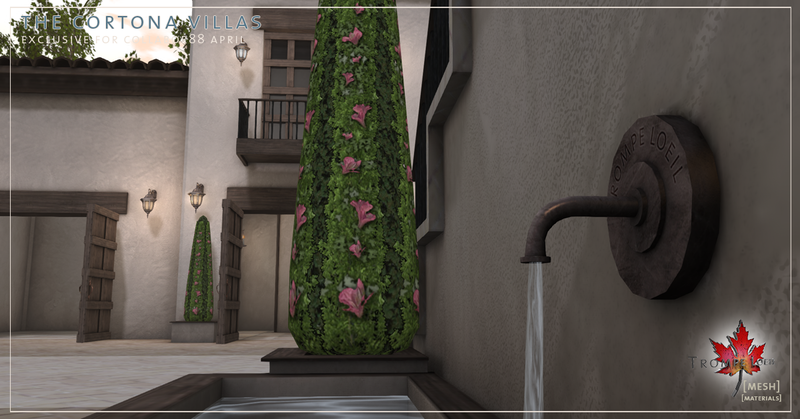 Relax as the water fountains and candlelight ease you into warm summer nights filled with romance! 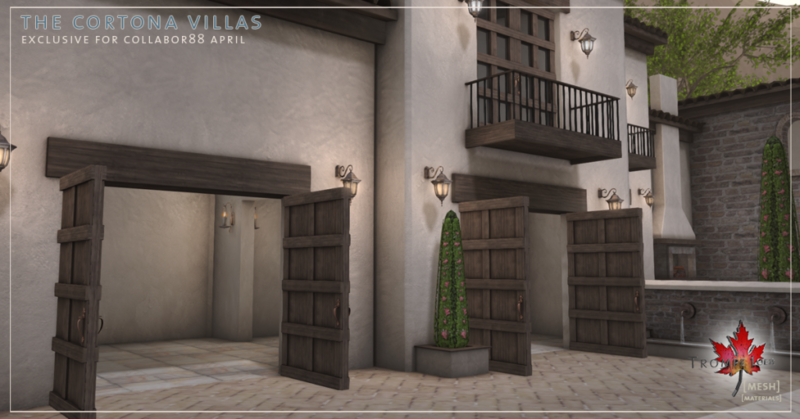 We’ve included working lockable doors, gentle three-stage lighting inside and out, a roaring fire that turns on and off on touch, careful materials enabling for a realistic look under changing lighting conditions, and our *home control scripting to make access permissions easy. 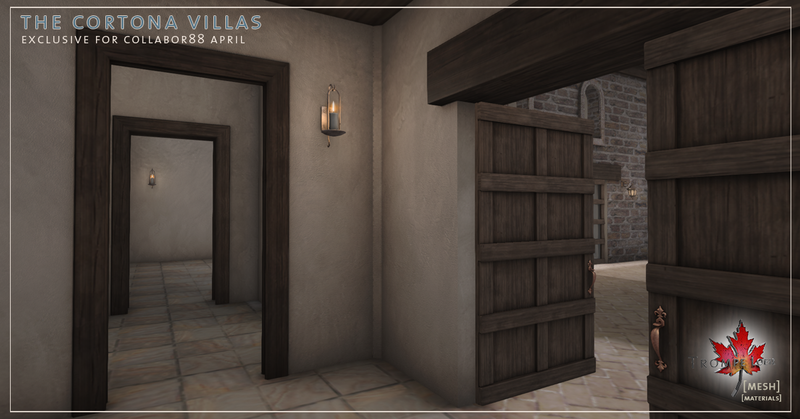 Set the doors to remain open or auto-close depending on your privacy preferences – we like keeping them open to let the spring air flow through the rooms and hallways. 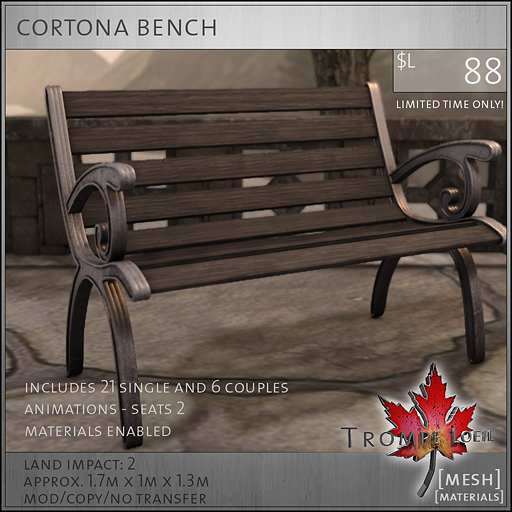 Pick up the matching Cortona Bench for easy outdoor seating! Fits 2 comfortably and includes single and couples PG animations. 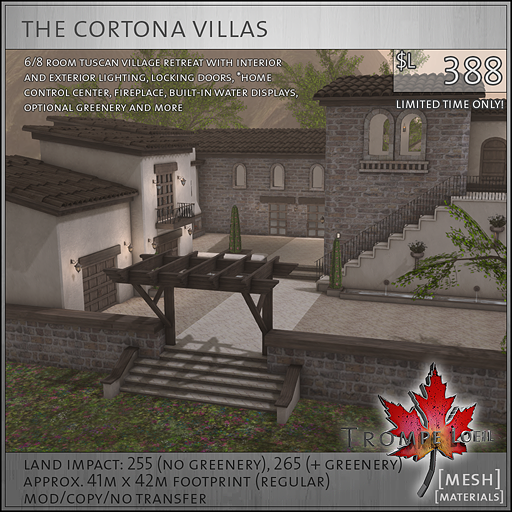 Grab everything Cortona only at Collabor88 for the month of April – these savings won’t last!